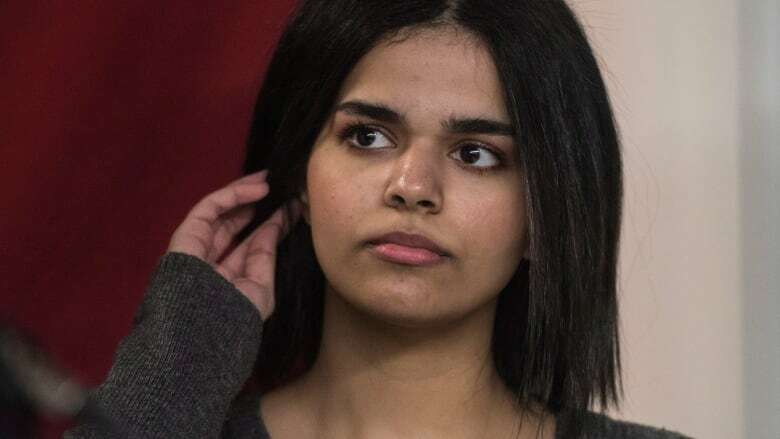 A Saudi teen who fled alleged abuse by her family considers herself "one of the lucky ones" now that she has arrived as a refugee in Canada, but the agency tasked with getting her settled has still arranged 24-hour security for her in the wake of online threats. Rahaf Mohammed al-Qunun, 18, arrived in Toronto on the weekend as a government-sponsored refugee, after taking to social media to allege abuse at the hands of her father. She said she was also fleeing attempts to force her into an arranged marriage. After locking herself in a Bangkok hotel room and tweeting details of her plight, including fears of what would happen to her if she returned to her family in Saudi Arabia, Canada permitted her entry as a government-sponsored refugee, acting on a United Nations request. Since arriving in Canada, she has dropped her last name, instead using Mohammed, saying her family has disowned her. Mohammed's public campaign, which was covered widely by international media, has also led to online threats against her, according to COSTI, the agency contracted by the federal government to help refugees, including Mohammed, get settled in Toronto. So steps have been taken to ensure there is someone with her at all times, be it an agency staffer or a private security guard. It's hard to say how serious the threats are, Mario Calla, executive director of COSTI, told reporters Tuesday morning. But, Calla said, "we are taking these seriously because she's our responsibility and so we want to be sure she's protected." Without offering details about what round-the-clock security will cost — other than to say it's "not a great amount" — Calla said either the federal government or COSTI will foot the bill. But he said it's "not unusual" for the agency to hire private security for refugees. There are about two "urgent protection" cases each year in which the government will expedite a refugee claim and ensure that person has extra security. Mohammed told CBC News on Monday that she was "exposed to physical violence, persecution, oppression, threats to be killed. I was locked in for six months," she said, in Arabic, describing what happened after she cut her hair. "I felt that I could not achieve my dreams that I wanted as long as I was still living in Saudi Arabia." In a brief statement to reporters on Tuesday, she called herself "one of the lucky ones," saying other women in Saudi Arabia have "disappeared" after trying to escape their circumstances, or feel powerless to even try. She said she is looking forward to living in Canada free to make her own decisions about her life. "I want to be independent: travel, make my own decisions on education, a career, or who and when I should marry. "I had no say in any of this. Today I can probably say that I am capable of making all of those decisions." She said she also plans to work in support of freedom for women around the world, "the same freedom I experienced on the first day I arrived in Canada." But first, there are many aspects of her new life that must be sorted out, according to Calla. COSTI workers will help Mohammed find permanent accommodations, as well as help her understand her "rights and obligations," apply for a social insurance number and health card, open a bank account and navigate the city. She will also start English classes before she considers how to further her education. A high school graduate, Mohammed does want to pursue post-secondary education, Calla said. Asked whether Mohammed's bold action will inspire others who seek to start a better life in a new country to take to social media, Calla was measured in his response, saying the social media landscape keeps changing and there are always "forces that make that difficult." He noted the number of refugees and displaced persons around the world totals upwards of 60 million, and only a third of one per cent of them get resettled. "Social media may now be a tool for them," Calla said. "It depends on whether they get the attention of the right people."